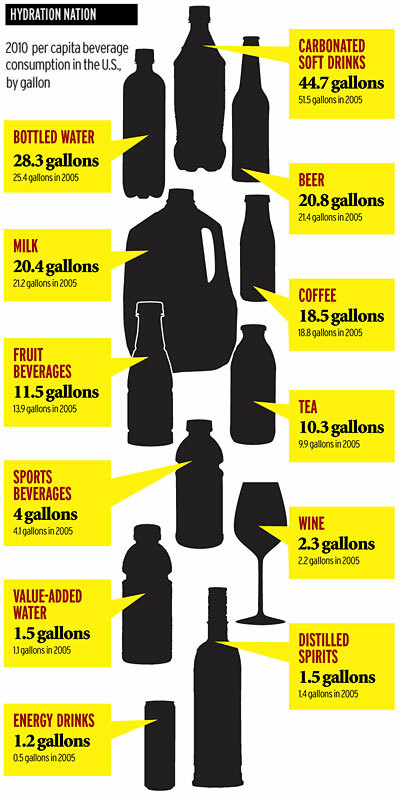 You are here: Home » Do Americans Drink More Milk or More Beer? 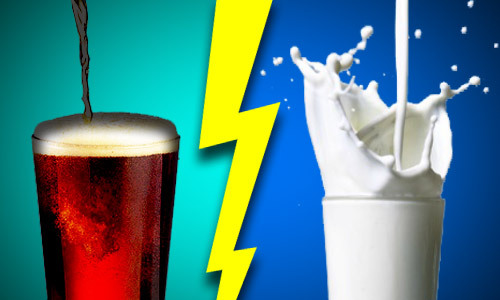 Do Americans Drink More Milk or More Beer? There’s nothing more wholesomely all-American than milk. You put it on your cereal, you put it in your coffee, you even cook with it. According to data from the Beverage Marketing Corporation, the average American consumed a whopping 20.4 gallons of cow juice last year. That’s more than distilled spirits, wine, energy drinks, tea and sports beverages combined. It’s more than coffee and more than fruit juice. While it’s impressive that beer bested milk (must be all those breakfast stouts!) the numbers are actually in decline. In 2005, Americans consumed 21.4 gallons of beer, so beer consumption has dropped a full gallon in the past five years, even as wine and distilled spirits nudged slightly upwards. Carbonated soda drinks took the biggest hit, down well over 10% from five years ago. It looks like people are skipping the sodapop and are instead choosing water (up almost 3 gallons since 2005) and Energy drinks (up 0.7 gallons, a gain of over 100%). I snagged this pretty chart from the folks over at Ad Age where you can find beverage industry experts prattling on about the nuances of the American beverage industry if that’s your thing. Knowing that Dragon’s Milk beat cow’s milk is enough for me! ← Jura 16: Slow Down and Smell the Flowers. There are a lot of factors not considered in this study. For one, homebrewing (as reported on this blog) is way up. Also, more people are getting their milk straight from farmers who don’t pasteurize. Our family does this and I brew a decent amount of beer. Of course, I too fall into that ~40 gallons of beer range. I think there are probably more homebrewers than folks buying milk direct from farms, so my guess is that beer would be on top if those numbers were figured in. Speaking for myself, if it’s not water, coffee, or beer, I pretty much don’t drink it. I’ll have a soda once every few weeks, and a “distilled spirit” once a month or so. Milk, tea, and wine probably make up less than 1% of what I drink over the course of a year. I would estimate my milk consumption at around 2 gallons over the course of a year. So… I definitely fit the mold of someone who consumes a lot more beer than milk. I’m exactly the same way. I drink 3 liters or so of water a day, probably damn near a gallon of coffee and beer a week (I’m guessing and too lazy to do the math). I don’t eat cereal, so I’m not using milk there, so I’m probably at the 2 gallon mark per year like you are. I’m OK with consuming more that the average beer-wise, since I rarely have a soda and never touch energy drinks. I think it balances out. Nope. My wife even quit diet soda. She now makes plain seltzer with the SodaStream I got her for Christmas. It’s all beer, water and coffee for me! What the hell is “Value-Added Water”? Does that mean overpriced? I assume it’s stuff like Propel. Or perhaps it’s Jersey tap water. Yes. It’s for people with more dollars than sense. Based on your kind words regarding Dragon’s Milk I picked a bottle up the other day. I compared it to Boulevard Imperial Stout. The trouble came when I set down to write the review on it, what the hell is it. I thought it was a stout but the bottle just says ale. It’s thin for a stout I guess but man is it delicious. Thanks for the heads up! Yeah, it kind of defies categorization, but it’s taste nonetheless!